The weird and wonderful sport that is horse racing constantly throws up shocks, surprises and astonishing results that keeps it entertaining and gets punters through the doors on a race day. Compared to the rest of the world the UK and Ireland arguably supply the greatest standard of racing in the world but when it comes to strange things happening on the course the rest of the world takes over. 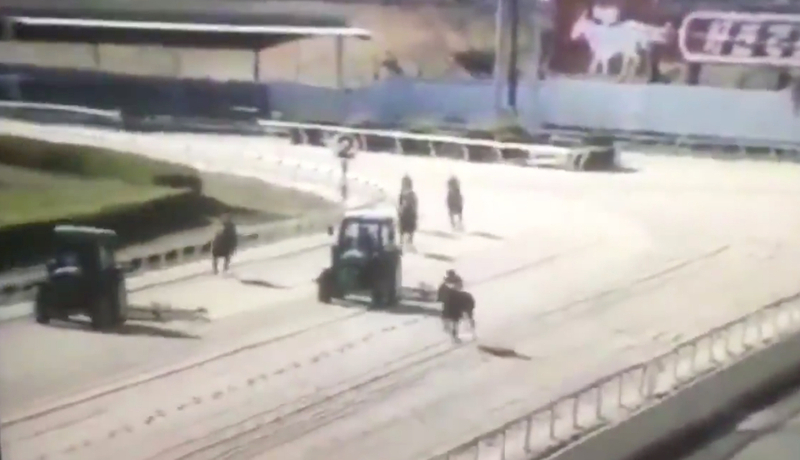 This video shows off one of the strangest moments on a racecourse when a race in a different country on the all weather looks to be just a normal contest before the horses make the turn for home and are greeted by the unexpected. The tractors that go round the track after the races to level out the all weather surface are still on the track and at the crucial part of the track where the race is won or lost. The respective horses turn the corner and two of the vehicles are taking up most of the course. With the riders still trying to win the race but without harming themselves or the horses there is some serious skill and ability shown to avoid the tractors. This has never been seen before in the history of horse racing and it can only be put down to the grounds people getting the times of when the races went off at wrong. Luckily all horses and riders and even the people inside the tractors were all fine, but it did make for a scary yet quite funny event and is a must watch.